I was told this is a duplicate and I know people don't like duplicates but I don't know what else but to ask again. 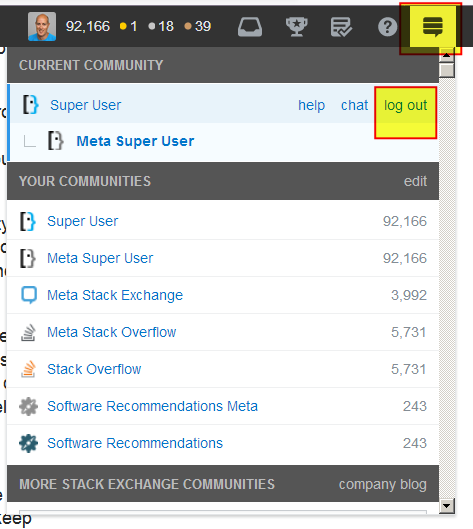 I checked the StackExchange icon and there is no log off there. PLEASE I'm so tired and I just want to close this down but I can't until I get an answer I can understand and use. This shouldn't be so hard to use. Did you look at the screenshot in this answer? If you're claiming that the "log out" link that's shown in that screenshot is not there for you, you're going to need to give us some proof -- take a screenshot of what you see and post it here (edit your original question here and include the screenshot). There's a marginal possibility that it's a bug in the site not displaying the log out link correctly, but more than likely you're simply scanning over it with your eyes and missing it. Also, you should be aware that there is no technical reason why you need to log out in 99.9% of cases. If you are sharing a computer with other people, and you don't want them to be able to access your accounts (like Super User), you should be clearing your entire browser's cookies/history when you close your browser anyway. Or browse using "Private Browsing" or "Incognito", so that closing the browser automatically "logs you off" by destroying the cookies on the machine that make you be "logged in". There is also a setting in most web browsers that will automatically trigger clearing out your browsing data, including cookies, when you close the browser. If you turn this setting on, and quit all windows/tabs of your browser, from that point forward nobody would have the ability to use your computer to access Super User until you log in again. If you aren't sharing a computer with anyone else, and nobody would ordinarily have the ability to login as your user on the computer you're using now, then logging out is basically pointless. Nobody can access your account, even if your browser stays "logged in", if your computer is secure and private. I've been using Super User since 2011 and have never once needed to log out. I have accessed Super User from places like a public library, and when I was done using the computer, I made sure that the browser would delete all of my browsing data: cookies, local storage, website history, cache, etc. This is actually a more thorough logout than logout itself, because if you logout without deleting your history, someone would be able to tell that you visited Super User, and maybe see which questions you looked at. Sure, the log out link should be there, and if it's definitely not there, that could be a site issue or a problem with your browser. But I can't envision a scenario where the inability to logout would keep you glued to your computer for any reason. You are clicking the wrong icon. How do I log out of this site?